This beautiful arts and crafts vase was an Ebay purchase from a seller who stated it came from a Maryland estate. 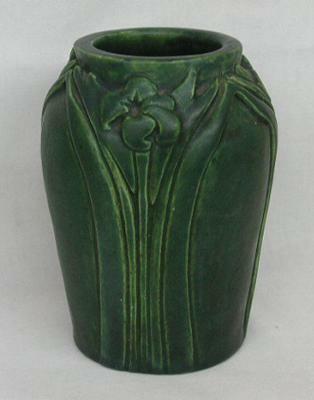 This green matte vase stands nearly 5 inches tall and has a raised floral motif on all 3 sides of the vase. 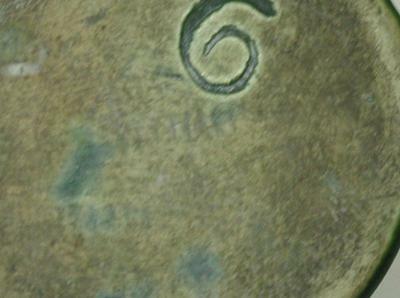 The bottom is marked with a 6 and 2 sets of letters that I cannot be make out, as well as the initials K.E or R.E. I have researched this piece and am unable to find a potter or company that produced this beautiful arts and crafts vase. If anyone can shed some light on the potter, when it was made or the factory, it would be greatly appreciated. Hi John, to me your vase looks more like Art Nouveau than an Arts and Crafts vase. Also used by Knight Elkin & Co in the form K.E.& Co or just K.E. in the mid-18thC. Which is probably a little early for the style.